Also called a Jack Arch. A straight arch along the springing line with a flat Intrados. The masonry units are laid out as voussoirs angled to a centre below the arch. 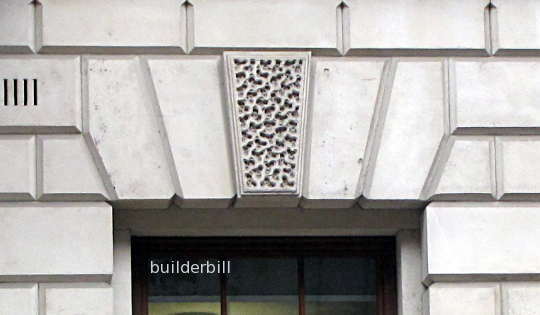 A flat arch that uses parallel sided voussoirs. 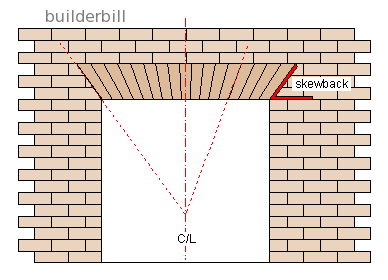 A piece of flat steel or angle iron that supports brickwork in a straight span. The angled abutment of a flat arch. 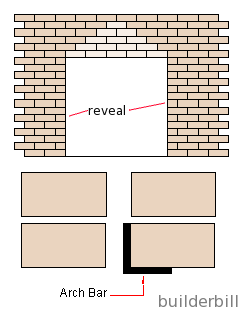 The side faces of an opening in a masonry wall. Above is a typical flat brick arch with wedge shaped voussoirs. The sloping section that the arch sits on (in brick and stone arches) is known as the skewback. One of the main reasons for the uptake of CMU modular block construction is that they do not need any of the extra work involved in making an arch over door and window opening. A couple of steel reinforcing bars and corefill and a beam is created. 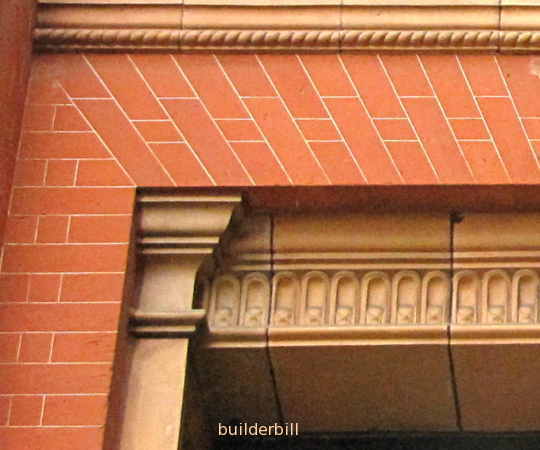 Walking around any city or town we can see many small flat brickwork spans that do not seem possible. 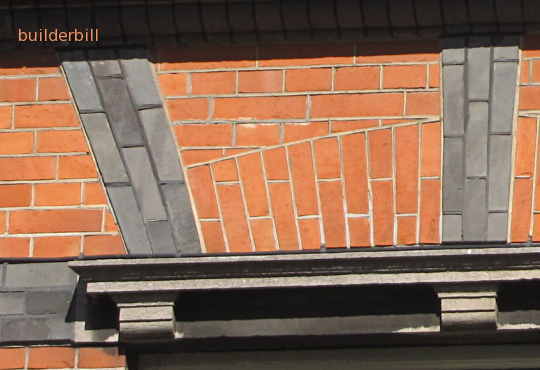 There does not seem to be anything that is holding up the triangle section of bricks above the opening apart from the mortar. What is out of sight is a metal arch bar or bars as seen above. Sometimes they are just a flat steel bar say 10mm thick or as I have drawn above an angle iron, again 8 or 10 thick. They are never thicker than the bed joint of the brickwork so that the course is in a straight uninterrupted line. The arch bars always sit on the sides of the openings and on larger spans they are temporarily propped during construction. A flat span of fine ashlar masonry. Almost unbelievably precise brickwork with 3mm wide joints. Seen at the Victoria and Albert Museum London, UK. An architect making a statement in Amsterdam with something different from normal. Construction of a French Arch. There is a lot of work involved in cutting and shaping the tapered voussoirs for these flat arches. One answer to that is to build a French arch as seen above. 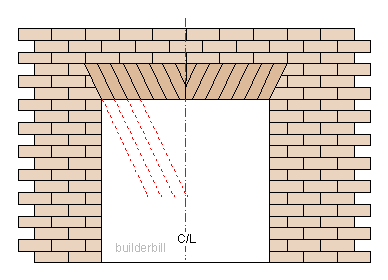 This uses standard brick widths and only the ends need to cut. It was practical in the days when these arches were popular for the brick makers to make purpose made arch bricks with the ends cut to the skewback angle for these types of flat arches, no cutting or shaping is required and the span of the arch does not alter the shape of the bricks. In some cases with these French arches a single purpose made stone key would be used.